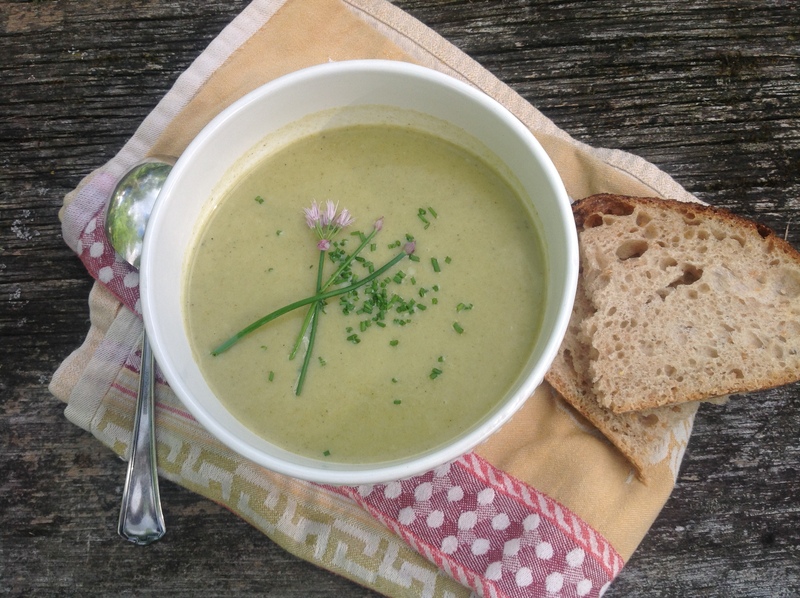 Vichyssoise is a refreshing soup to enjoy on a hot summer day. Fans of juicing with greens will know how nutritious the greens of vegetables are, yet most are discarded(guilty!). I recently made radish tartines and thought the peppery greens would be a good substitute for watercress in vichyssoise. I gave it a try and the soup was quite delicious albeit a little less peppery than if made with traditional watercress. It was a pretty pale green. Serve with a big hunk of bread on the side. In a stockpot, heat the oil and add the leeks, cooking until soft, stirring to prevent burning. Add the potatoes and the stock. Bring to a boil, reduce and cook until potatoes are soft, about 15 minutes. Add the radish greens and cook for another 5 minutes to wilt. Cool and purée until smooth in a blender. Add the buttermilk and pulse to combine. Season with salt and pepper. Chill 2 hours or overnight. This entry was posted in Recipes and tagged buttermilk, chilled soup, leek and watercress soup, radish greens, vichyssoise, vichyssoise with buttermilk, vichyssoise with radish greens by Johanne Lamarche. Bookmark the permalink. mmm. . . It looks wonderful. Until I read this post I never thought about using radish greens in a recipe. You and me both Sheryl! My neighbor, an organic gardener, had given me the radishes and as he picked them said if I juiced the peppery greens could be used. I felt too guilty to discard them and starting thinking how I could use them. I figured they were similar in taste to watercress and vichyssoise came to mind. Since I experimented with substituting them in, I had a French friend tell me her sister in Provence makes vichyssoise for her with radish greens every year on her visits! 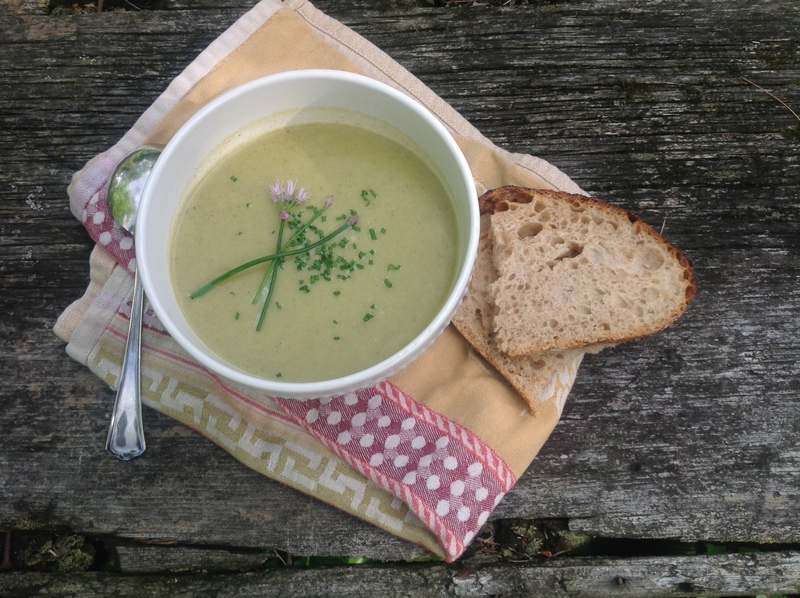 Radishes must be on an upswing – I’m seeing them here and there in magazines and now in this lovely soup! I didn’t plant any, but then it’s never to late to plant them, is it? 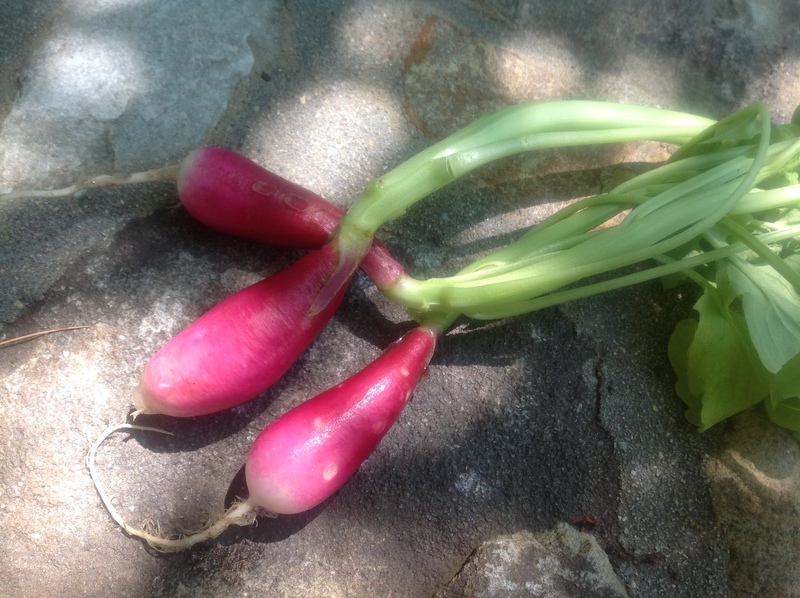 Radishes are one of those fast growing crops you can plant again in the late summer/early fall so you can still get in on the game! Or find a neighbor who wants to share😄 and cheat like me! lol!! My Dad always planted his radishes a week or two apart and kept them going in rows all summer long…it’s so much fun for kids, especially, because they can grow all kinds of them! I would like your dad! :). Is he the French connection or your mom? I always radishes are so French. My parents loved them and my mom grows them in zone 1a, proof they’ll grow anywhere!